Being healthy takes effort. Every. Single. Day. Some of those healthy behaviors are harder to manage than others. Fortunately there are digital resources that can help! Check out the few I’ve discovered and determine whether they may be of interest. Do you find yourself gulping down food in a matter of 2 or 3 bites? If so, a mindful training tool, like this app, might help you slow down. You’ll enjoy the taste of your food and become fuller faster. Eager to lose weight but lacking motivation? How about a financial incentive to get you going? By signing up for a money based challenge, you commit to a start date and see your goals through to the end. Place a bet you’ll reach your goal, if you don’t, you lose that money. If you do, you win money! How does streaming yoga videos free of charge sound? Yes, please. Good stress or bad stress, it’s still STRESS! This app helps reduce stress and anxiety, and promotes a more restful sleep with guided meditations, Sleep Stories, breathing programs, and relaxing music. Limited capabilities with free app but subscription available. This app collects health data from your iPhone, Apple Watch, and third-party apps that you already use, so you can view all your progress in one convenient place. Besides managing your activity, sleep, mindfulness and nutrition did you know it can store a Medical ID card, your health records and can even sign you up to be an organ donor! Done. How much time do you spend on your device? Are you curious? Track how much you (free) and your family (requires subscription) use your phone, tablet and apps each day, automatically and set limits. Track your sleep with or without an Apple Watch. Discover how much time you spend in deep sleep and your resting heart rate. Very detailed and surprisingly quite accurate! Track liquids, other than water, as part of your hydration efforts. The app calculates the water percentage in your beverage of choice and even keeps track of how much of each beverage you drink. Also offer reminders and syncs with a variety of devices. What’s one of your favorite health and wellness apps or resources? Please share! Sedentary, 65 and older? It’s never too late to start a physical activity program! Over the age of 65, and sedentary, but want to start a structured physical activity program? Here are a few steps to safely begin a program and incorporate fitness into your life. Educate yourself on the weekly amount of structured activity needed. According to the Centers for Disease Control and Prevention individuals 65 and older that are in good health and have no limiting health conditions should strive for 150 minutes of aerobic (also known as cardio) activity per week as well as two total-body strength workouts. 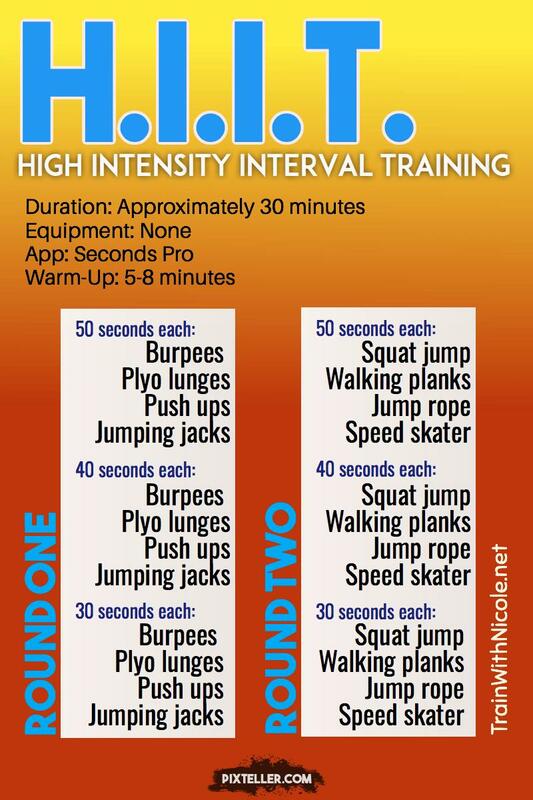 Aerobic activity needs to be performed at a moderate intensity. For example, on a scale from 1 to 5 – one being the feeling of lounging around the house and five being out of breath – you need to be working at a level 3, possibly a 4. A total body (legs, back, chest, abs, arms) workout should be performed at least two times a week. These basics requirements are for those active older adults that want to maintain their health, weight and fitness level. If you are want to achieve greater goals (improved health, weight loss, train for an event) then up to 300 minutes a week of aerobic activity and possibly an additional day of strength training is required. Fortunately, your aerobic activity doesn’t have to be in 60 minutes increments. Ten minutes here and fifteen minutes there can make your aerobic activity cumulative. Strive to meet the basic recommendations for structured activity as described above. This is your first step in starting a physical activity program. Find an activity, or two, that you enjoy. Does your gym, health club, fitness or community center offer group fitness classes? What about local churches or social clubs? SilverSneakers® programming is offered nationwide and can be found at most of these establishments. Look into class schedules to determine what works best for you. What about participating in a sport such as swimming or golfing? This may be the time to start a private lesson or join a league. Perhaps meeting a friend for a walk, jog or hike is more appealing. Ask your children or grandchildren about gaming systems such as the Wii, XBox or Playstation. These devices, as well as good old fashioned exercise DVDs, will allow you to workout in the comfort of your own home and for much less than a gym membership . If all else fails, seek out a reputable and certified personal trainer for guidance. By opening your mind to what is available and identifying an activity (or two) that you enjoy, you’re more likely to exercise regularly. On a weekly basis, schedule and complete your activities. Just as you would schedule an appointment with your doctor or dentist, schedule your activities. Write it on your calendar or in your daily planner. Use an app if you are tech saavy. Be specific. For example, “2PM on Sunday. I will walk 3 miles outside.” or “Monday at 11:30AM I will attend the group strength training class at the community center with my friend, Bob.” Scheduling and completing your activities will ensure your long term success. Make adaptions based on your limitations. With any new activity, the body will need time to adapt. Learn to make adaptations for orthopedic or medical conditions (this is where a personal trainer can be helpful). Take things slowly to prevent injuries. Modify the exercise to fit your abilities. If you have been sedentary, 150 minutes of weekly aerobic training might be unrealistic. Instead, start with 15-20 minutes, three times a week. After one or two weeks, progress the duration or frequency of the activity. Continue in this manner until your body can handle the increased activity level. Making adaptations will ensure that your body responds properly to the increased activity level and help prevent injuries. Even if you are sedentary and 65 years or older, it is never too late to start a physical activity program. The body has a unique ability to respond to exercise regardless of its age. Delaying or preventing disease, improving mood, managing stress, and pain management are all benefits of regular exercise. Use these steps to incorporate fitness into your life and you will soon be able to achieve the physical results and health benefits you’ve always wanted. • Set a weekly mileage or step goal. Write down your weekly goal and plan for it. What time will you walk? Where will you walk? What distance will you cover? Your mileage or steps should be a planned activity, not part of your every day movement. With a moderate walking pace you should be able to complete 4 miles* in 60-65 minutes. Over the course of seven days, you could easily accumulate a minimum of 20 miles. If your are new to walking, start with 1-2 miles a week. Add a ½ mile per week until you reach your weekly goal. Work to complete the distance first, then you can work to increase your speed, if you so desire. If using a pedometer to record steps, work to accumulate 8,000 steps (steps to miles chart) a day. • Walk at a moderate intensity. Using a scale of perceived exertion from 1 to 5 (1 is very easy, 5 is very hard) your walking should be at a level 3 or 4. A steady music tempo can help maintain intensity. If you enjoy listening to music while you walk, use your own music playlist and set a steady tempo (general range is between 120-140bpm). You can do this by using the Tempo Pro Magic app. Yet another app, RockMyRun–yes, you can use it to walk–changes the tempo of the music you’re listening to in order to match your pace. Explore other apps that offer similar features. • Monitor your progress. How far did you walk today? What was your pace? How did you feel after your walk? Journaling, whether in a notebook or online, works well along with a pedometer. Those who are tech savvy can use an app, such as MapMyWalk. Within this app you can monitor your pace, record your distance and join in group challenges. Friends and family members (that use this app) can connect with you. It’s a great source for motivation, encouragement and friendly competition. • Mountain Ridge Middle School and Jenkins Middle School have tracks open to the public. • Chapel Hills Mall’s route is 1.41 miles. A great indoor alternative! • Create a support system. Join a walking group or recruit a walking buddy (or two!). Discover local MeetUp groups in your area like this local walking club. Are you local and looking for a walking buddy? Reply below with your contact information & let’s see if we can connect you with someone! *As an alternative, 4 miles could be accumulated over a 24-hour period. This tip came from one of my class participants. She makes time for exercise during the day by adding alerts/reminders to her smart phone. She uses these alerts/reminders to take a 15-minute break. During this time she walks up and down the halls or uses the Step platform that she keeps by her desk. For variety, she performs a few of the exercises that she has clipped from magazines. She keeps them posted on the back of her office door. Creating alerts/reminders forces her to accomplish a minimum of 15-minutes of physical activity. This system works as a reminder to stop and move. It also helps relieve stress throughout the day. Physical activity can be accumulated throughout the day. Strive for a minimum of 150 minutes of cardiovascular training a week.